WhatsApp is rolling out Two-Step Verification for all users, to verify login attempts. This is not exactly a new feature, because it has been in the beta test channel for nearly 3 months, since Mid-November. However this should not be confused with the more commonly used two-factor login which randomly generates a 6 digit number. 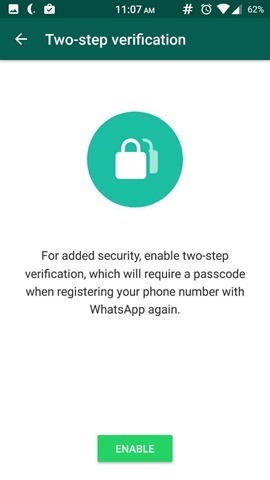 Instead, WhatsApp's Two-Step Verification is sort of like a password (passcode since it is , which you will need for verifying your phone number, when you install WhatsApp on your phone. 1. Open WhatsApp and go to the Settings menu. 2. Select the Account option. 3. Now tap on Two-step verification . Once you set a passcode, you will be asked to verify it by keying it again. You will be asked to enter your email address, when you set the Two-Step Verification, but this is entirely optional. This acts like a fail safe, in case you forget the passcode. 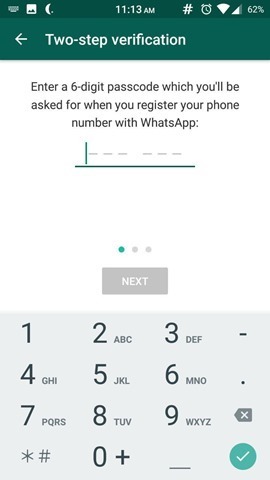 WhatsApp will periodically ask you to enter your passcode, so you don't forget it. There is no option to disable this minor annoyance. 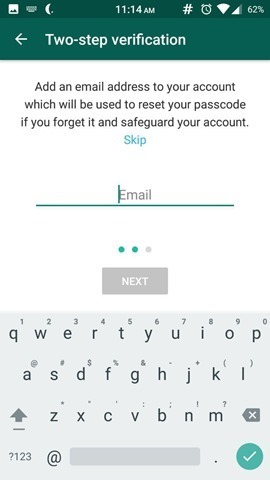 The bad news is, WhatsApp does not send a verification email, so you have to be sure to enter the correct email address, but the app does ask you to enter the email id again, during the set up. But you can change the email address anytime from the two-step verification screen. WhatsApp end to end security enabled on latest version.